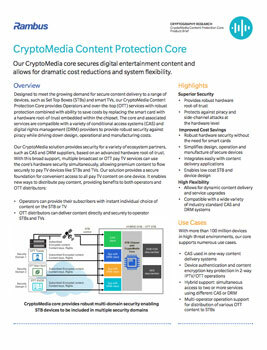 Designed to meet the growing demand for secure content delivery to a range of devices, such as Set Top Boxes (STBs) and smart TVs, our CryptoMedia Content Protection Core provides Operators and over-the-top (OTT) services with robust protection combined with ability to save costs by replacing the smart card with a hardware root-of-trust embedded within the chipset. The core and associated services are compatible with a variety of conditional access systems (CAS) and digital rights management (DRM) providers to provide robust security against piracy while driving down design, operational and manufacturing costs. Download the whitepaper by completing the form on the right.